Ronald Ames Guidry (/ˈɡɪdri/; born August 28, 1950), nicknamed "Louisiana Lightning" and "Gator", is a former Major League Baseball (MLB) left-handed pitcher who played his entire 14-year career for the New York Yankees of the American League (AL). Guidry was also the pitching coach of the Yankees from 2006 to 2007. Guidry's major league career began in 1975. He was a member of World Series-winning Yankees teams in 1977 and 1978. He won the AL Cy Young Award in 1978. He also won five Gold Glove Awards and appeared in four All-Star games. Guidry served as captain of the Yankees beginning in 1986; he retired from baseball in 1989. In 2003, the Yankees retired Guidry's uniform number (49) and dedicated a plaque to him in Monument Park. Guidry was born in Lafayette, Louisiana. He attended and pitched for the University of Southwestern Louisiana. He was a combined 12–5 with a 2.03 earned run average (ERA) and 137 strikeouts as a two-year letterman with the Ragin' Cajuns baseball team in 1969 and 1970. Guidry was selected in the third round (67th overall) by the New York Yankees in the 1971 MLB draft. After four seasons in the minor leagues, he pitched briefly in the major leagues in the 1975 and 1976 seasons. He was nearly sent to the Baltimore Orioles as part of a trade deadline deal on June 15, 1976, but the Yankees did not want to give up any more left-handed pitchers beyond the three (Scott McGregor, Tippy Martinez and Rudy May) that they had already included in the deal. In 1977, Guidry began the season as a relief pitcher but was moved into the Yankees' starting rotation. Guidry finished the season with a 16–7 record. He helped lead the Yankees to a World Series championship. In 1978, Guidry posted a career year that has been described as the all-time best season by a Yankees pitcher. Against the California Angels on June 17, he struck out a Yankee-record 18 batters. Guidry's 18-strikeout performance is usually cited as the launching pad of the Yankee Stadium tradition of fans standing and clapping for a strikeout with two strikes on the opposing batter. For the season, Guidry went 25-3, in a season that is among the top 10 for winning percentage in baseball history. He led the league with a 1.74 ERA, a .893 winning percentage, nine shutouts, and 248 strikeouts. Guidry's success during 1978 was due in large part to his mastery of the slider. His 248 strikeouts set a Yankees' team record for most strikeouts notched by a pitcher in a single season. Guidry's 25th win of the 1978 regular season was his most significant, as it came in the Yankees' 5–4 win over the Boston Red Sox in a one-game playoff at Fenway Park in Boston to determine the American League East division winner. The game is best known for Bucky Dent's seventh-inning, three-run home run that gave the Yankees a 3–2 lead. Later that month, the Yankees again won the World Series over the Los Angeles Dodgers. Guidry won the 1978 American League Cy Young Award unanimously. He also finished second in the American League Most Valuable Player voting to Boston Red Sox slugger Jim Rice. In addition, Guidry was named The Sporting News AL Pitcher and Major League Player of the Year. Guidry was named to the American League All-Star Team in 1978, 1979, 1982, and 1983. Known as an excellent fielder, Guidry won a Gold Glove each year from 1982 through 1986. In 1984, Guidry won the Roberto Clemente Award, given annually to the Major Leaguer who "'best exemplifies the game of baseball, sportsmanship, community involvement and the individual’s contribution to his team.'" On August 7, 1984, Guidry struck out three batters (Carlton Fisk, Tom Paciorek and Greg Luzinski) on nine pitches in the ninth inning of a 7–0 win over the Chicago White Sox. Guidry became the eighth American League pitcher and the 20th pitcher in Major League history to accomplish the so-called "immaculate inning." In 1985, he led the American League with 22 wins. Guidry and Willie Randolph were named co-captains of the Yankees on March 4, 1986. The latter years of Guidry's 14-year major league career were hindered by shoulder and elbow injuries. He retired from baseball on July 12, 1989. Ron Guidry's number 49 was retired by the New York Yankees in 2003. Guidry's number 49 was retired on August 23, 2003. The Yankees also dedicated a plaque to Guidry in Monument Park at Yankee Stadium. The plaque calls Guidry "a dominating pitcher", a "respected leader", and "a true Yankee." Each living Yankee previously honored with a plaque in Monument Park was on hand for the ceremony: Phil Rizzuto, Yogi Berra, Whitey Ford, Reggie Jackson and Don Mattingly. Guidry joined Yankees manager Joe Torre's coaching staff as pitching coach in the 2006 season, replacing Mel Stottlemyre. Guidry was criticized in 2007 because the Yankees' highly-acclaimed pitching staff was underachieving. In 2007, Yankees pitchers walked the sixth-most batters overall in the Major Leagues; this was the most walks in a season for a Yankees pitching staff since 2000. Torre's departure from the Yankees following the 2007 season ended Guidry's tenure as pitching coach. Though he was interested in returning to the Yankees for the 2008 season, he was not offered a position on new manager Joe Girardi's coaching staff. He did return to the Yankees as a spring training instructor. Former New York Times writer Harvey Araton wrote a book called Driving Mr. Yogi: Yogi Berra, Ron Guidry, and Baseball's Greatest Gift that profiles the friendship Guidry has with Yankees' Hall of Fame catcher (and Guidry's former coach and manager) Yogi Berra. ^ a b Grossman, Evan (August 24, 2003). "GUIDRY, YANKS CAUGHT LIGHTNING IN BOTTLE". NYPost.com. Retrieved April 6, 2019. ^ "2016 Baseball Media Guide". Louisiana Athletics. Retrieved April 6, 2019. ^ "Cajuns in the MLB Draft". Louisiana Athletics. Retrieved April 6, 2019. ^ "Ron Guidry Minor Leagues Statistics & History". Baseball-Reference.com. Retrieved April 6, 2019. ^ Chass, Murray. "Players Swap Memories of Yankees-Orioles 10-Player Trade", The New York Times, Sunday, June 15, 1986. ^ Sbalcio, Chris. "MLB Power Rankings: New York Yankees' 25 Greatest Pitchers in Team History". Bleacher Report. Retrieved April 6, 2019. ^ Friend, Harold. "Ron Guidry (25-3) Had a Better Season Than Jack Chesbro (41-12) for the Yankees". Bleacher Report. Retrieved April 6, 2019. ^ "Yankees Single Game Records | yankees.com: History". Newyork.yankees.mlb.com. Retrieved June 18, 2012. ^ a b "Remembering Ron Guidry's amazing 1978 season". MLB.com. Retrieved April 6, 2019. ^ a b c d "Ron Guidry Statistics and History". Baseball-Reference.com. Retrieved June 18, 2012. ^ "Yanks' new strikeout king? Severino chases Louisiana Lightning". ESPN.com. July 1, 2018. Retrieved April 6, 2019. ^ "Baseball's Best | MLB.com: Programming". Mlb.mlb.com. October 2, 1978. Retrieved June 18, 2012. ^ Eskenazi, Gerald (November 8, 1978). "Rice Is MVP., Guidry 2d". Retrieved April 6, 2019 – via NYTimes.com. ^ a b "Special jerseys part of UL's Ron Guidry Weekend". The Advertiser. Retrieved April 6, 2019. ^ Moses, Sam. "YANKEE FROM LOUISIANA". Vault. Retrieved April 6, 2019. ^ Chass, Murray (February 14, 1984). "Guidry Reluctant to Relieve". Retrieved April 6, 2019 – via NYTimes.com. ^ Calcaterra, Craig (September 4, 2018). "Roberto Clemente Award Nominees announced". NBCSports.com. Retrieved April 6, 2019. ^ "9 Pitches – 9 Strikes – 3 Outs / Immaculate Innings by Baseball Almanac". Baseball-almanac.com. Retrieved June 18, 2012. ^ Writer, TIM ROSAFORTE, Staff. "YANKEE TRADITION MERE WORDS WITHOUT GUIDRY". Sun-Sentinel.com. Retrieved April 6, 2019. ^ "Yankees GM: Derek Jeter should be the last team captain". USA TODAY. Retrieved April 6, 2019. ^ Chass, Murray (July 11, 1989). "Guidry To Retire As Yanks Spurn Bid". Retrieved April 6, 2019 – via NYTimes.com. ^ Loubier, R. J. (July 12, 2016). "On this day in Yankees history - Ron Guidry retires". BronxPinstripes.com. Retrieved April 6, 2019. ^ "Guidry's number retired". Chicago Tribune. August 24, 2003. Retrieved June 18, 2012. ^ "Brian Cashman: New York Yankees GM Is Digging His Own Grave". Bleacher Report. April 15, 2011. Retrieved June 18, 2012. ^ "The First 19 Games Under Torre A Clue To Yankees Pitching?". WasWatching.com. April 25, 2007. Retrieved June 18, 2012. ^ Brescia, Joe (December 23, 2007). "Guidry Hopes He's Wearing Pinstripes in the Spring". The New York Times. Retrieved May 22, 2010. ^ "Breaking News, World News & Multimedia". www.nytimes.com. Retrieved April 6, 2019. ^ Driving Mr. Yogi: Yogi Berra, Ron Guidry, and Baseball's Greatest Gift (9780547746722): Harvey Araton: Books. Amazon.com. ISBN 0547746725. 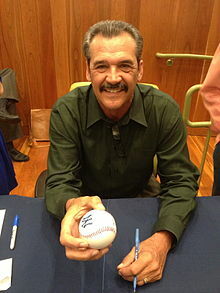 Wikimedia Commons has media related to Ron Guidry. This page was last edited on 6 April 2019, at 10:44 (UTC).